One for a map maybe, showing where they thought they were aiming for and where they hit - beyond my capability unfortunately. Great detail in that Dave; a fine post. Confirms the hammer story; I didn't know it was made in Germany. Remarkable the Germans didn't hit Sheffield earlier and harder. The Germans built the dop-hammer ... given the build up to the War; why did they do that ? and why didn't we build it (obviously not it would come from the Far East, but, at the time weren't we meant to be good at such stuff ? The fate of the Marples Hotel (London Mart) December 12th. "Mary Walton in her book " Raiders over Sheffield" ascribed the tragic loss of life to the fact that the roofs of the cellars in the London Mart were not strengthened. The people who survived the explosion were said to have been in the smaller bottling cellar that had a stronger ceiling. Given the buildings size and structure the staff at the pub thought that it would be able to withstand significant bomb damage. A case of complacency? Possibly but I think the more likely cause is the size and impact point of the bomb on the pub which caused the building to fall in on itself." Just how big was that bomb ? Are there any structural engineers around here that can pass comment on the "falling in on itself" comment, wouldn't an explosion cause the opposite effect, could a bomb cause an implosion ? I'm not qualified or intelligent enough to work this out. Have any plans of the Marples ever been found ? or even looked for ? Why would the cellars have different strengths of roofing ? Surely a seven storey building needs support of a regular nature ? The smallest cellar had the strongest roof ? Does that make sense ? The biggest cellar, yes, I could understand that. Was the bottling cellar off to one side, or protected by its location, was it under a stairway or behind stronger, supporting walls ? If you want me to get the copy I have scanned by Stuart you may have to wait quite a while for a copy. Just another aspect of busy lifestyles and poor weather getting in the way. Any, and all historical input always appreciated, for the benefit of us all. Newspapers, articles, magazines, pictures (birthdays, weddings, funerals, buildings, sports, transport etc etc), certificates, builds/demolitions, openings/closings, bible dedications, wartime letters, postal items, old holiday photos (note old), grannies retirement "do" - whatever there is - we are keen to have it on here. Please offer whatever you can. In another topic I have commented on the mutual respect that British and German engineers had (and still have) for each others manufactured goods. In particular I mentioned the British using Leica cameras (made by Ernst Leitz Ltd, Germany) during the war for espionage and spying work and the fact that the most successful German fighter aircraft, the Messerscmitt BF-109, original flew using Rolls Royce engines. So it comes as no suprise that our drop hammer was actually made in Germany. It is claimed to be "the only drop forge hammer in Europe capable of pressing out the crankshafts for Rolls Royce Merlin engines used in the Spitfire and Lancaster bomber"
The Germans made the hammer and also made some formidable aircraft of their own, - the Messerscmitt BF-109 being one example. As these aircraft were the German equivalent of the Spitfire, - matching it in performance (although this constantly increased throughout the war through several different Marks / Versions of each aircraft in an attempt by both sides to constantly gain an upper hand in air supremacy) then its engine, the Junkers Jumo 210 must have been the "equivalent" of a Rolls Royce Merlin. It follows then that it must have had a similar crankshaft in terms of size and power loading and the Germans must have made it somewhere without the use of one of their drop forge hammers that was very inconveniently (for the Germans) located in Sheffield and was too busy knocking out bits for Spitfires to knock out a few bits for them to have a go at us with. That makes perfect sense Richard. The smallest roof has the smallest area and mass and as the supporting walls are closer together it gets the greatest support. As there is no great unsupported length in a short section of roof there would be a lot less give in it. The biggest cellar, with a long section of unsupported roof would therefore be the weakest. Get a 12 foot plank of wood to represent the roof and 2 piles of bricks to represent the 2 supporting walls. Put the 2 piles of bricks 3 feet apart to represent a small cellar and balance the plank on top of them to represent the roof. Now stand on the plank between the 2 piles of bricks and jump up and down a bit. Now move the 2 piles of bricks 10 feet apart to represent a big cellar, repeat the experiment with the plank and standing / jumping on it. Notice the difference in the plank and the effect this would have on the "strength" of a roof. The "falling in on itself" was probably the effect of the bomb falling through several floors (5 or 6 of them) and exploding on the lower floor. This would have the effect of blowing out the floor which is supporting the ones above, leaving them to collapse in a heap. We have witnessed this ourselves in Sheffield several times over the past 15 years or so with the demolition of the 15 storey tower blocks on the Norfolk Park Estate. Engineers carefully dismantle strategic parts of the ground floor (presumably to prevent "toppling", - or even to force it in one direction if it has to avoid another nearby building) and then fit explosive charges to the remaining ground floor supports which are now holding the building up. When the charges are blown and the supports blown away all the upper floors collapse on top of each other forming a very confined heap of rubble. All the Norfolk Park Tower blocks demolished in this way fell safely into quite confined spaces. The one which used to be near the shopping centre and Bluestone school (BEECHES) was dropped into a very confined space with no damage to the shops or school which were only yards away, - had it toppled in the right direction it could have destroyed the entire row of shops. A couple of the blocks higher up the estate were very close to the main road (Park Grange Road) but were felled without spilling out onto the road, - in fact the road was reopened shortly after the tower was down. The description of the bombing of the Marples says the bomb fell through several floors of the building before exploding at, probably the ground floor, creating a similar effect. Having said that, in the 9-11 attack on the twin towers of the World Trade Centre in New York I seem to remember these towers "falling in on themselves" as well. That would have been fortunate for many New Yorkers as the area is extensively built up and had it collapsed sideways it would have done considerably more damage than it did resulting in even more deaths and injury. But why did it "collapse in on itself" when it wasn't blown up from the bottom? It was hit by an aircraft flying at high speed quite high up the tower. I think I have got part of the answer to Richards question here but the 9-11 incident tells me there is something missing. Any structural engineers or demolition experts know? There was a TV documentary which attempted to answer this very question. It "reconstructed" the whole episode from start to finish. Can't remember the conclusion but the answer is out there in the TV archives. Just from witnessing on TV this awful event it is clearly possible to hit a tall building high up and for it to collapse onto itself rather than to fall sideways like a Fred Dibnah chimney, but I wouldn't have expected it. However I still think the fate of The Marples, and the high death toll, was due to the bomb falling through several floors of the building and exploding at ground floor / cellar level where most people in the building would have been most likely to be. The bomb exploding inside a packed building just yards from people would have killed most people instantly, but then for the upper 5 floors of the building to come crashing down on top of you, - not a chance! 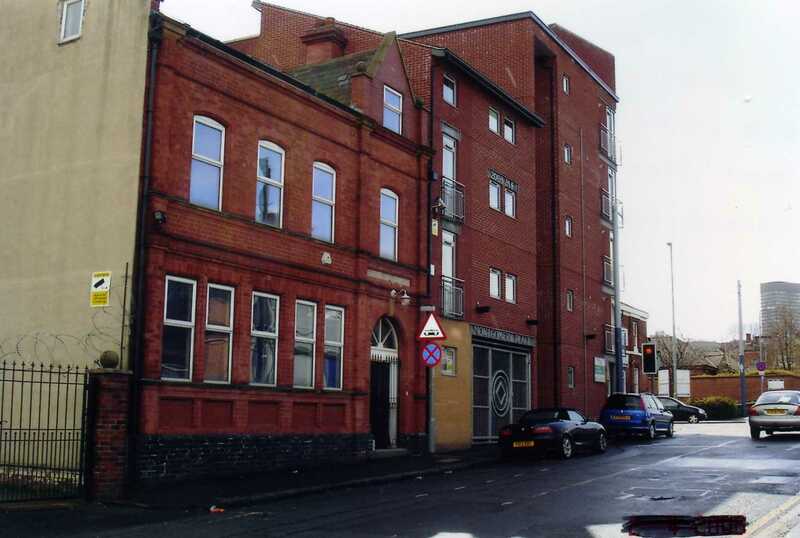 it was situated between St Philips Road and Montgomery Terrace Road. so I guess the Williams bakery would have been number 50 or 48.
of Blanchards on Infirmary Road. had found this second world war bomb. The large glass doors are where the gate to the back of the shops used to be. water as they were advised to do then. This was standard advice for incendiary bombs. These are small (usually just over a foot in length) and light but were dropped in a concentrated area in large numbers. As the name incendiary implies, they were not particulary explosive but were designed to start and spread fires which would be difficult to put out. To do this they used phosphorus, a chemical element which in its "yellow" allotropic form is spontaneously combustible in air. Once burning it isn't easy to put out and it melts from the heat of it burning and flows everywhere therby spreading the fire. Phosphorus is safely stored under water. Before catching fire it fumes giving off a white smoke with a distinctive "phosphoric" odour (a bit like a box of matches, - except that they have sulphur in them too). When this happens the phosphorus is drying out and is ready to ignite. Anyone finding a small bomb, giving off fumes and a strange chemical smell was advised to place the bomb in a bucket of water which should prevent it from igniting. The bombs were bad enough, but in later years phosphorus became the basis for that more evil weapon NAPALM, designed to stick to your skin and clothes while it was burning. I remembered this because one of my relatives, Edwin Wainwright was one of the un-named survivors of the Marples bombings who "just walked away unharmed and was never heard of again"
Well, he may have been lucky to survive the bombing but he certainly wasn't "unharmed" as the mental scaring it caused him altered his life and personality forever, ultimately leading him to take his own life. I'd like a copy of that if someone could oblige please. There was a short item on BBC Look North news tonight (Sunday 12 December 2010) about the Sheffield Blitz. That in itself is quite an achievement for a local news programme which me and Stuart have retitled "Look Leeds" rather than "Look North" due to presenters fixation with just covering the Leeds area and being very reluctant to cover any other Yorkshire towns like Sheffield. In it they said a bit about the raids, showed a few of the iconic shots (City burning behind a sillouetted burnt out tram) and then talked to a few older Sheffielders in the street about their recollections. It says in the souvenier issue that there is to be another one next week, - so you need to get a copy of next Saturdays Star ordered now, or get Stuart to get one for scanning. 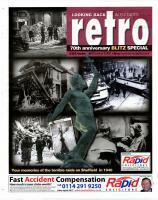 Interestingly it says the next one, issue 2, contains stories by the children who lived through the Blitz. Now that is confusing when you compare it with what is in the current issue 1 isn't it? 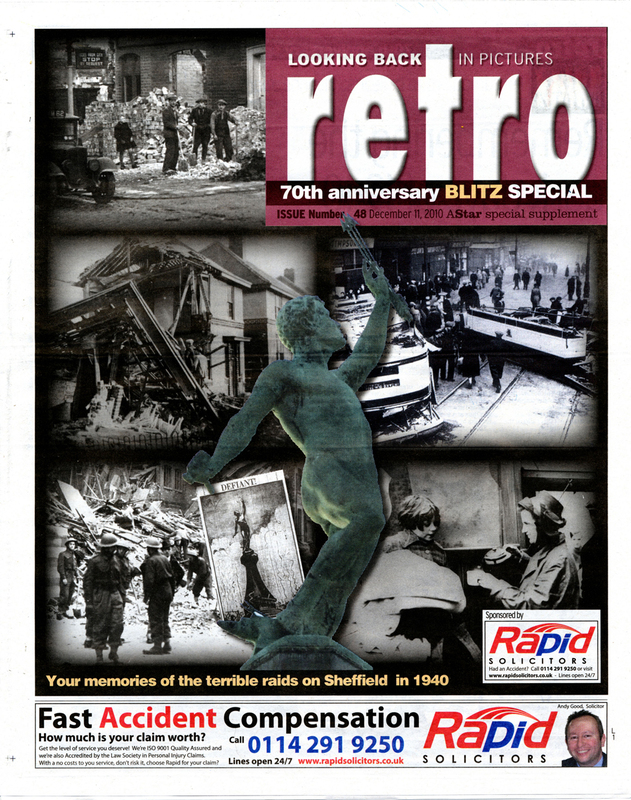 If you interview someone who is in their late 70's or 80's now (which they did in issue 1) then given that the blitz was 70 years ago wouldn't these same people have been children then? Anyway issue 2 is described as childrens stories from the blitz. 45p is less than the cost of even half a pint of beer. When I'm done chasing stuff, I may investigate each of those names and addresses Sheffield-related because I bet nobody else has been daft enough to. As an example, was Lily Taylor the daughter of Mrs Annie Taylor (same address in 1919 and 1925) ? Was her Father called Philip Taylor (different address, but Holme Lane and 1911) - we need a 1911 Census expert to answer that one. Richard - I have somewhere an excel file of all the civilians killed in Sheffield which II think can be sorted by date, name etc - I'll find if you want it? Yes please, I'm sure there is more we can know about these people and a decent list is as good a place as any to make a start. Sorry Stuart but I have never liked Christa Ackroyd in the same way as I don't like Clarkson. She comes across as smug and arrogant like he does. She has also unfairly criticised teachers in the past, and when she herself is criticised for anything she doesn't like it, one of these that can dish it out but can't take it herself. Further to this Christa makes too many of these mistakes and so comes across as being "a bit thick", - she must have been near the end of the queue when they were handing brains out. So, of all the presenters that Look Leeds could have sent to Sheffield she was probably the worst one for the job. "OK so we have got to do an item on the 70th anniversary of the Sheffield Blitz so someone will have to go to Sheffield"
"Not me". "I'm not going". "Send someone else on that one". "Do we have to?". "Isn't there something here in Leeds we can do instead" etc. "Well, its only Sheffield, lets send Christa, won't matter if she messes it up"